Skin disorders are a relatively common problem for dogs, and can stem a variety of causes including food or environmental allergies, parasites and fungal infections. The main symptom of a skin disorder in any animal is persistent itching. While all dogs scratch, when your canine companion has a skin disorder, regular scratching will soon progress to rapid, intense scratching that often breaks the skin. If this happens, bacteria can get into the wound and cause an infection, which will require topical and/or oral antibiotics to treat it. Skin where your dog is itching is also likely to become red, inflamed, swollen and very tender to the touch. As the saying goes, the more you scratch the more you need to itch. This is due to the release of serotonin, which intensifies the itch sensation. In short, it is a cruel cycle. The best way to stop the itching and help prevent infections in your dog is to treat the skin disorder that is causing it. Fleas are a common parasite found across many animals, including dogs. They feed off of the blood of their host, and their saliva is an irritant for many pets. Once the saliva gets into the skin, it can cause a rash and intense itching. To successfully treat fleas on your dog you also need to treat your home as fleas can survive without a host for a number of months. As well as seeking flea ointment from your veterinarian, you will also need to thoroughly boil wash all bedding and vacuum carpets, furniture, floors and skirting boards at least one a day to eradicate fleas at each stage of their lifecycle. Vacuum bags should also be sealed and thrown away after each use so that the fleas do not escape back into your home. Ear mites and mange mites are the two primary types of this parasite. Ear parasites live off of the scale and fluids within the ear of your dog, and are more common in animals with dirty ear canals. Therefore, a good cleaning routine is important to help prevent the initial infestation. Regular preventative spot-on treatments should also be given to stop this highly contagious parasite. If your dog does contract ear mites, medication should be sought from your veterinarian, and your dog should make a full recovery. Mange mites are what causes the condition known as scabies, which can affect the humans in your household as well as your pets. Again, it is far better to prevent mange mites using the correct anti-parasitic treatment. However, they can be treated using a combination of oral medications and topical treatments to ease the itching. Ticks are another common parasite affecting dogs, particularly those that live in areas that are particularly wooded, grassy or swampy. The ticks lie in wait, ready to attach themselves to your dog as they brush past. Ticks carry a range of serious diseases and so prompt treatment is essential. Ticks must be removed carefully, without squeezing the body or allowing its head to get stuck inside your dog. You can buy special tick-removal devices that help you to twist the tick out and remove it whole. The tick should then be disposed of in the bin so that any blood inside it doesn’t escape and cause a risk of infection. Preventative treatments against ticks are widely available and highly recommended. Allergies are notorious for causing skin disorders in dogs as well as humans. They can be prompted by environmental or food changes, and often appear out of the blue. If you believe that your pet has a food allergy then you should speak to your vet about undertaking an elimination diet to get to the cause of the intolerance. This can take weeks or even months, but can help prevent the skin from flaring up in the future. 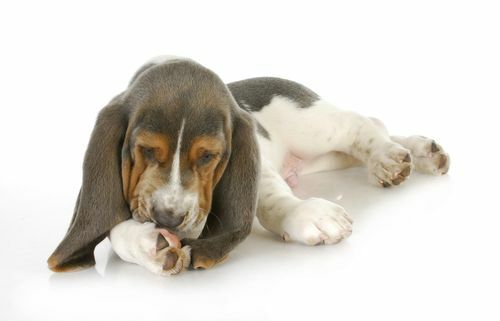 In the meantime, your vet may be able to prescribe some topical treatments to alleviate the itch. If you suspect your dog’s skin disorder is the result of an environmental allergen, bathing your furry friend in cool, plain water will help to wash away any irritants and soothe his skin. Steroid treatments can be prescribed by your vet for both food and environmental allergies, but there are serious side effects to these drugs and so your veterinarian may only recommend them if other, less severe options fail. Ringworm is actually a fungal infection that affects most dogs at some point during their lifetime. It is easily spread from animal to human and so prompt treatment is always recommended. Your veterinarian may recommend that you try a medicated shampoo or ointment to kill the fungus, but in some cases, stronger, oral medication may be necessary. If your dog has a skin disorder you should always seek the advice of Dr. Matthew Roth before you start any sort of treatment. However, prevention of any condition is almost certainly easier than cure, so ensure that your canine companion is up to date with all of his vaccinations and anti-parasitic treatments.